Prices for most commodities, including oil, are forecast to rise in 2017 as a long period of declining prices appears to be bottoming out, according to the October Commodities Markets Outlook . Oil prices are forecast to rise to $55 per barrel next year from $43 per barrel in 2016 as markets readjust after an era of abundant supply that outpaced demand. Energy prices, which also include coal and natural gas, are forecast to jump 24 percent in the coming year. The decision in September of the Organization of the Petroleum Exporting Countries (OPEC) to resume limiting oil production is another important factor behind the higher price forecast. 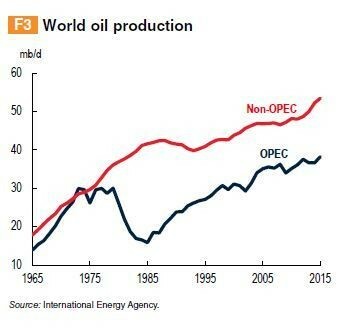 When OPEC members announced that they would aim to cap production at around 33 million barrels of oil per day, it signaled the potential end to two years of unrestrained production. Oil prices had fallen as low as below $30 per barrel during that period. Details of the plan, which does not include important producers Iran, Libya and Nigeria, have yet to be worked out and are due to be announced in November, but markets have begun to anticipate a return to higher prices. Metals prices are projected to rise more sharply than expected in 2017, in the last forecast in July, as a result of rapid mine closures ahead of schedule. However, a further growth slowdown in China could weigh on metals prices. Metals fell 9 percent this year. Food prices are forecast to rise modestly as a decline in grains prices is expected to offset a rise in prices for other food commodities. 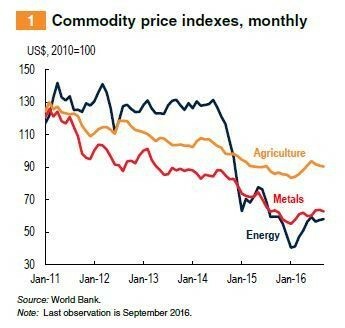 Larger than expected increases in energy prices, a key cost component in agriculture, could push food prices even higher than forecast. The risks of disruption from the La Niña weather pattern have diminished. Precious metals prices are expected to fall in 2017 as appetite for safe-haven buying ebbs with rising interest rates. Gold is expected to dip to $1,219 an ounce from $1,250 an ounce this year. Commodity-exporting emerging market and developing economies have been particularly hard hit by the rout in commodities prices, and the World Bank has projected growth in these economies to be near zero this year. A recovery in prices, however modest, could point to brighter growth prospects.